lessening the grade to the water. filled with winter's last snow. To a peak I can't name anymore. I can still name you. Sticks like resin to skin. In a single sleeping bag. to those we thought would help us. circling a space we only thought vacant. into the earth by accidents, famine and war. and the lines crossing your face, were mine. After years we shrugged one night toward opposite walls. Not finding each other, even under one blanket. where timber camps lodged three hundred men. canoeing through overgrazed range for one stinking fish. 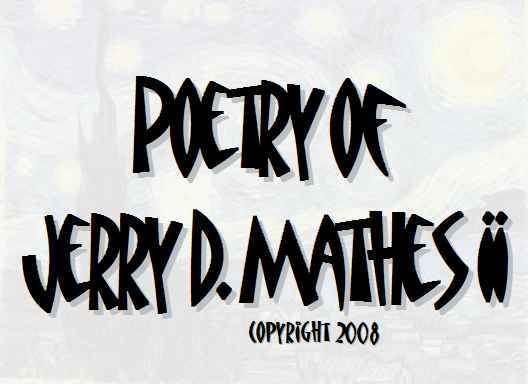 Copyright 2008, Jerry D. Mathes II. © This work is protected under the U.S. copyright laws. It may not be reproduced, reprinted, reused, or altered without the expressed written permission of the author. Jerry D. Mathes II is a recipient of a Jack Kent Cooke Scholarship. In 2008, Lewis-Clark Press will release his collection of poems, The Journal West, and Finishing Line Press will publish his chapbook, Fall in the Borderland. His work has appeared or is forthcoming in many journals, including Shenandoah, Camas, The Dos Passos Review, Grist, and Tar River Poetry and received Special Mention for Fiction in The Pushcart Prize XXXI. In the summer he fights wildfire on a helicopter-rappel crew and is a graduate of the University of Idaho's MFA program. His current project is a novel about love, death and wildfire on the Mexican border.